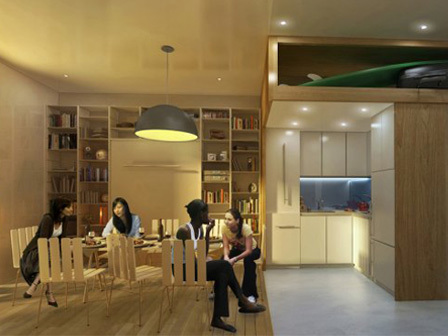 MyMicroNY was the winner of the "adapt NYC" design competition staged by the New York City Department of Housing Preservation and Development. The competition was staged to decide on a winning design and developer team to build a demonstration project aimed at showcasing how, using modern design concepts and the latest in construction technologies, apartment units which are smaller than the current code requires, can provide an outstanding and affordable urban living experience. The studio apartment units will vary between 270 SF and 350 SF in area and will feature 10 foot tall ceiling heights, Juliette balconies, high style interior finishes, large bathrooms, and ample storage space. The building will feature many common areas throughout the building including community rooms and a roof deck. 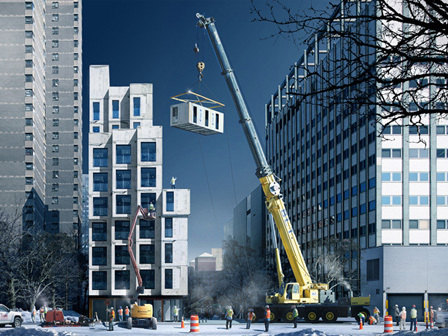 The building will be constructed using modules fabricated by Capsys in our Brooklyn Navy Yard facility. These modules will be factory finished with all bath, kitchen, window, door and casement work complete. The project was designed by nArchitects and is being developed by Monadnock Development and the Actors Fund Housing Development. 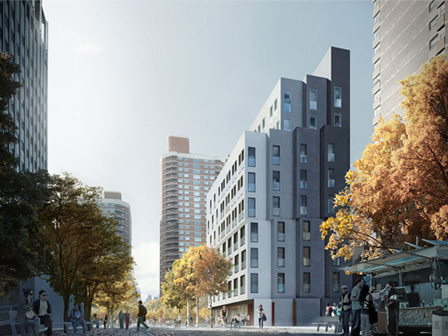 This project is the first of its kind to be constructed in Manhattan.